This morning started very early - 4:30am. 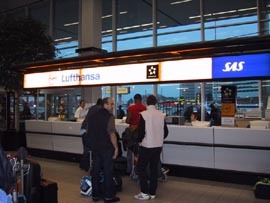 The flight to Istanbul was on Lufthansa airlines through Frankfurt. 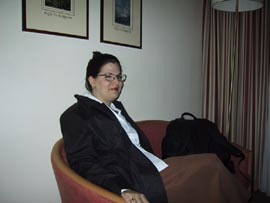 Unfortunately, the day before we heard that the union pilots of Lufthansa were in a legal strike position that night. Richard was up late, catching up email, updating the web site and checking Lufthansa's web site for any information on the potential strike. By the time he went to bed (about 1am), it was fairly certain that the Frankfurt-Istanbul leg would be cancelled. A taxi was waiting for us downstairs at the Tulip Hotel right at 5:30am - a beautiful Mercedes taxi that had been prepaid by the SDGN (thanks for a great conference, Joop!). 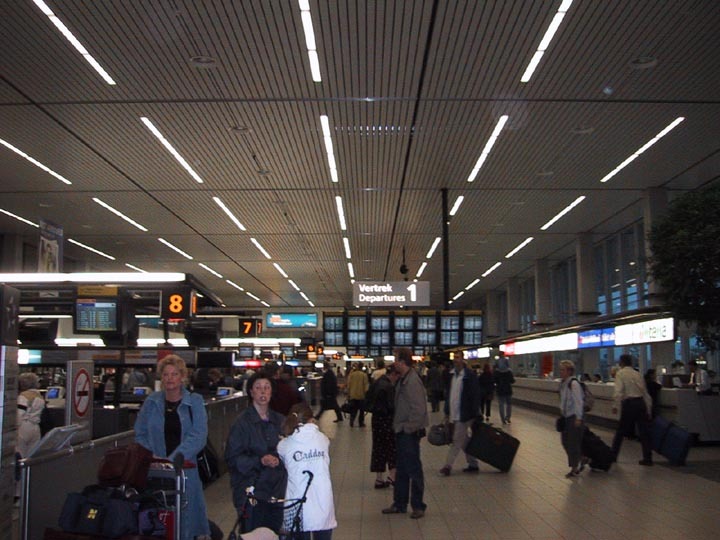 We were whisked off to Schipol airport in no time, there was very little on the road. This is Stacy's "its the wee hours of the morning but I'm still trying to smile" face. 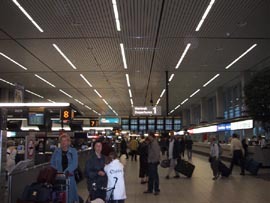 Welcome to Schipol airport. Mind the Dutch. 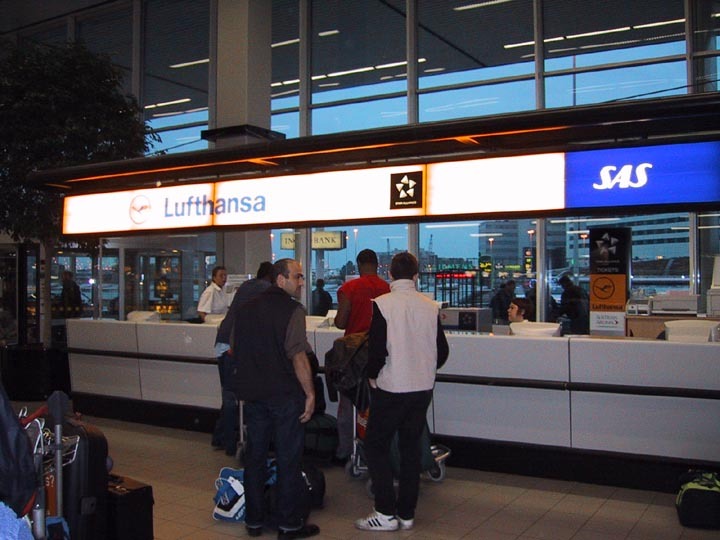 When we arrived at Schipol airport, we waited in the business class line for Lufthansa, only to be told we had to go to the ticket counter to have our tickets re-issued: it appeared our flight to Istanbul was cancelled. We got to wait in another, even LONGER line for our tickets. The ticket agent at the ticket counter confirmed the cancellation and attempted to route us to Istanbul through Munich... then gave up and rebooked us on a KLM flight direct from Amsterdam to Istanbul, saying "you don't want to go to Frankfurt right now anyway." Considering that the striking Lufthansa pilots are at Frankfurt, we really appreciated the change. 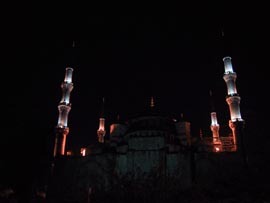 All that was left to do now was to contact the hotel in Istanbul and let them know we had changed airlines and arrival times (KLM instead of Lufthansa, 2pm instead of 1pm). A long walk through the Schipol airport led us to the KLM lounge, where we had a little breakfast and relaxed, waiting the two hours for our flight. 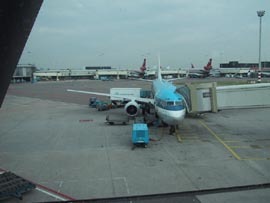 Calls were made back home (it was late evening there) and then to Istanbul (two hours later than Amsterdam) to warn them we were coming in later than planned, and on a different airline. Waiting at the Lufthansa ticket queue for a new flight to Turkey. 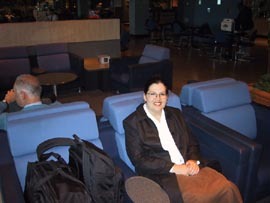 Stacy's "I'm almost awake but its still too early" smile in the KLM lounge. 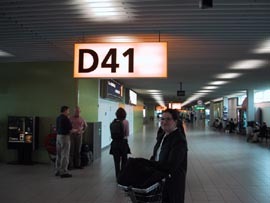 A couple of unusual aspects to the flight - its free-for-all boarding, no "rows 15 and higher" discipline here. Quite surprising for a Dutch airline, but I suspect that language problems are a factor that makes the row controls ineffective. Another interesting thing about KLM aircraft - all the seats are the same. Better than "regular" coach seats, not as nice as North American business class seats, the only different between coach and business class (no first class on intra-European flights) is the meals served. And the food on the KLM flight was excellent, not as fancy as first class intercontinental flights, but tasty and satisfying. 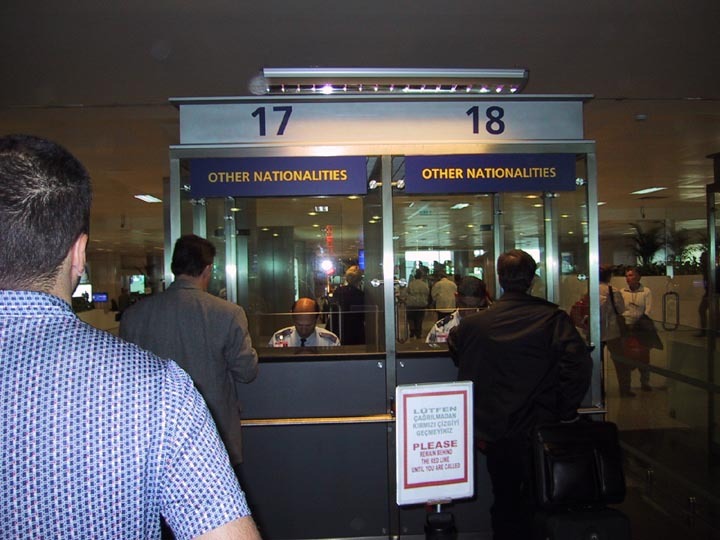 The flight was brief, and the next thing you know, we were queued up at the passport line in Turkey. Exchanging Guilders (Dutch money) for Lira (Turkish money), 55 Guilders = 17 million Lira. 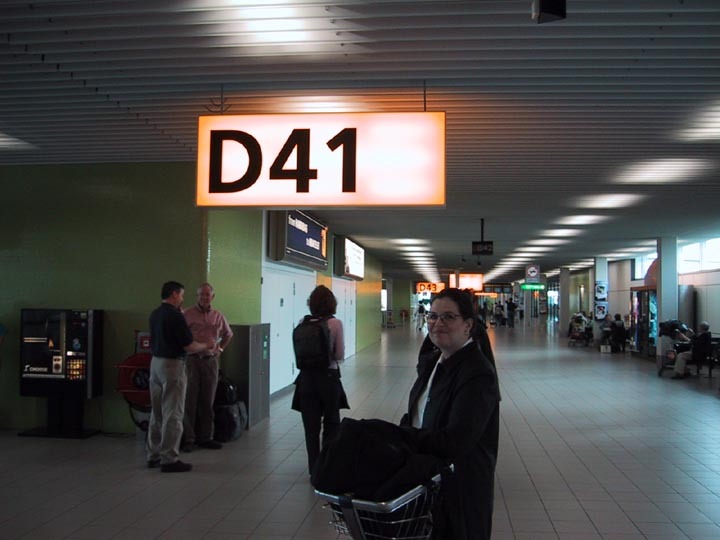 Okay, we're at the gate, where's the plane? There's the plane. Nothing magical for a trip to Turkey, just a plain old 737. 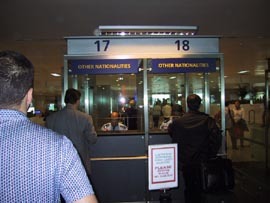 The passport officer in the left hand kiosk yelled at Richard for taking this picture. 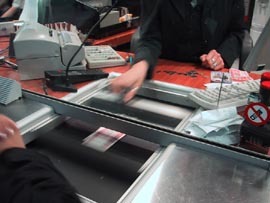 After surviving our encounter with customs and waiting forever for our bags (we checked a couple in a moment of weakness), we were met at the exit to the luggage area by a nice young man with the name Richard Campbell on a card. He drove us from the airport to the Sultanahmet Palace Hotel in the Sultanahmet district of Istanbul. 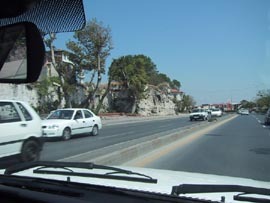 Driving to the hotel past the remains of the Byzantine city walls... Our driver standing at the road in front of the hotel. 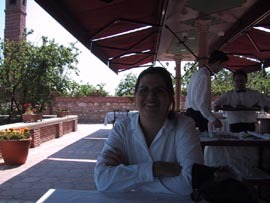 Unfortunately, since we arrived a bit early, our room wasn't ready yet, but the manager invited us out onto the south terrace to have some tea while we waited. 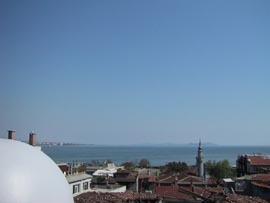 There are two terraces in the hotel, one facing the Marmara Sea, the other facing the Blue Mosque. 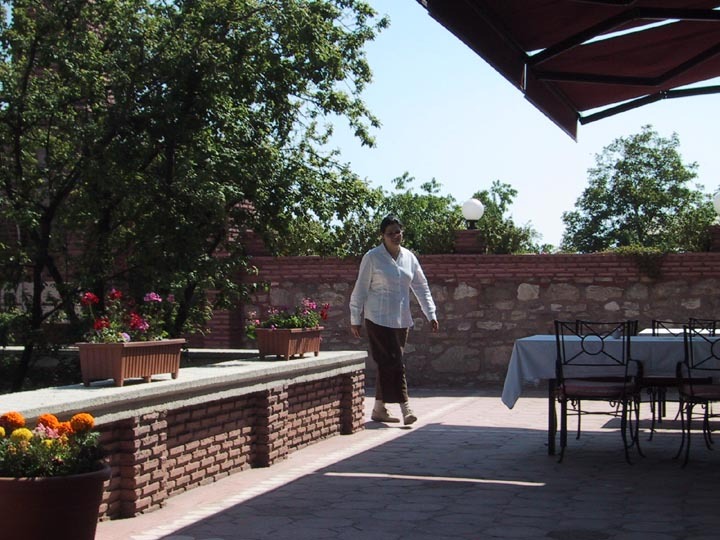 A stay at the hotel includes breakfast out on the terrace every day. Stacy sitting in the shade on the terrace, waiting for some tea, dealing with the concept of being in Turkey. 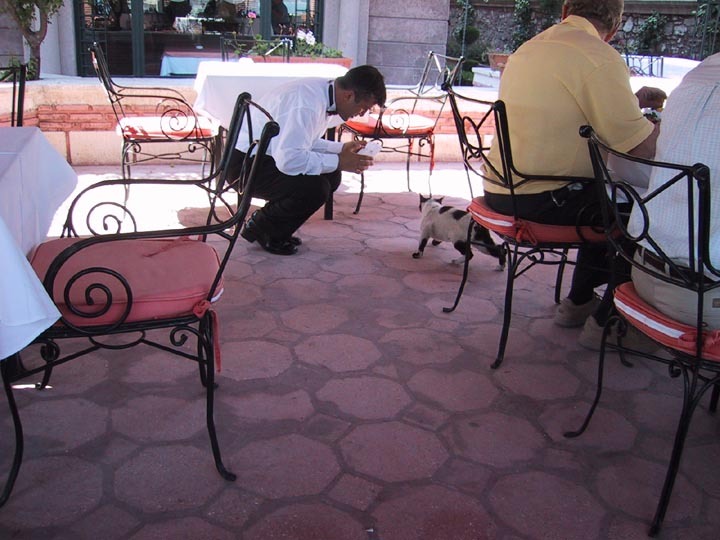 Stray cats do well on the terrace, the waiters feed them table scraps and then shoo them off... oddly enough, they always come back. Stacy taking a look around the terrace. The view of the Marmara Sea from the terrace of the Sultanahmet hotel. Just as we were settling in and thinking "Wow, what a great place!" 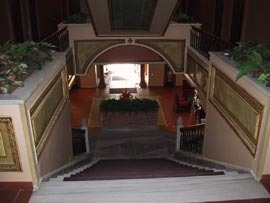 our room was ready, so we headed up to take a look at it and the rest of the inside of the hotel. 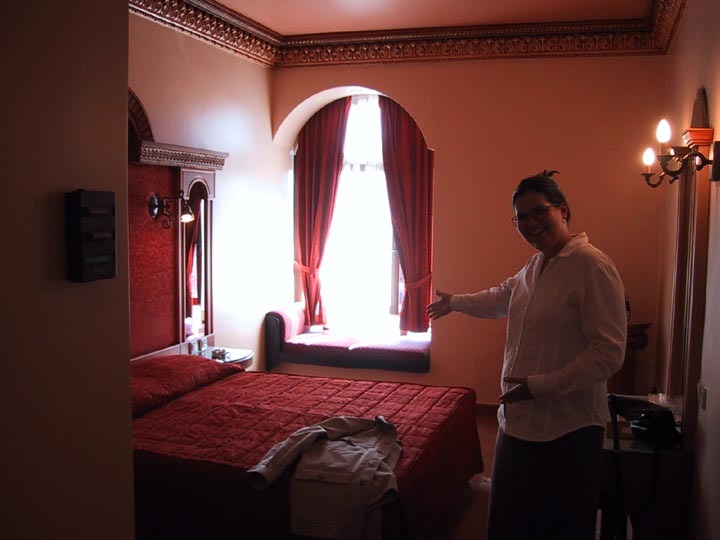 A look at the bed and window of our room in the hotel. The bed is very hard, but we sleep well on it. A view of the doorway to the room, closet on the right, Stacy (aka Vanna White) is standing beside the bathroom. 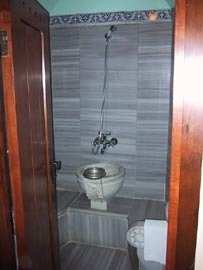 The Turkish Bath-type bathroom in our hotel room. Sink is on the right, toilet on the left. The basin in the middle has no drain, the whole room is essentially the shower room, all marble. 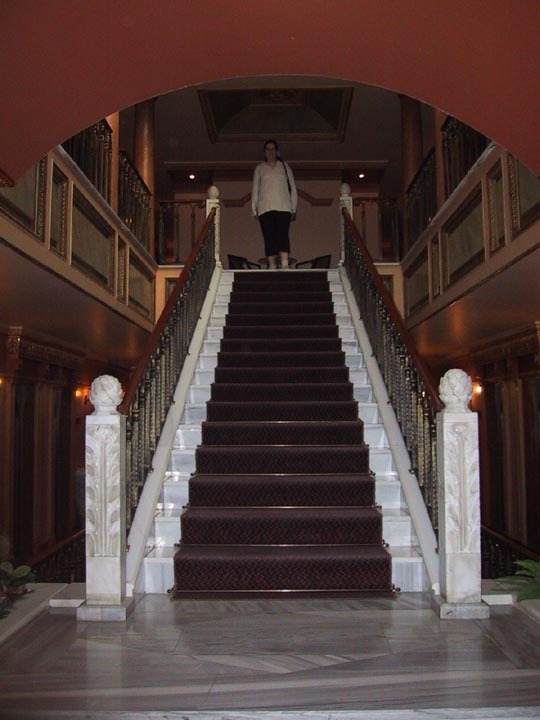 Stacy at the top of one of the marble staircases of the hotel (the Turkish love marble, its everywhere). Our room is down the corridor to the right. 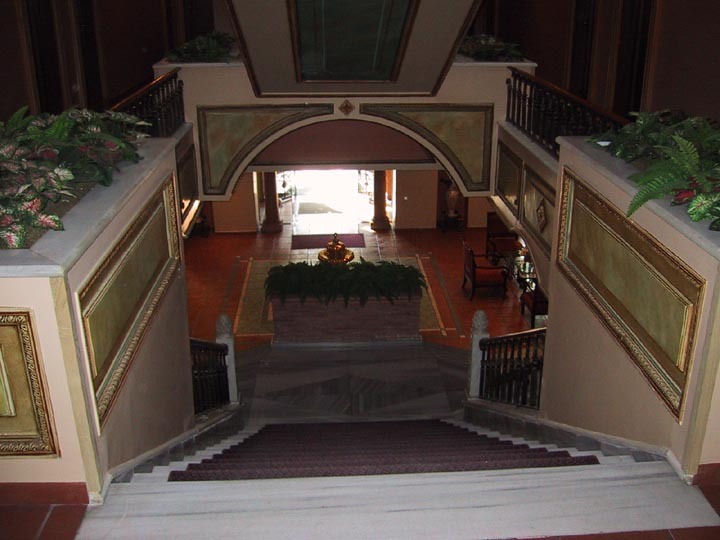 A look down the main staircase (also marble) to the main entrance of the hotel. 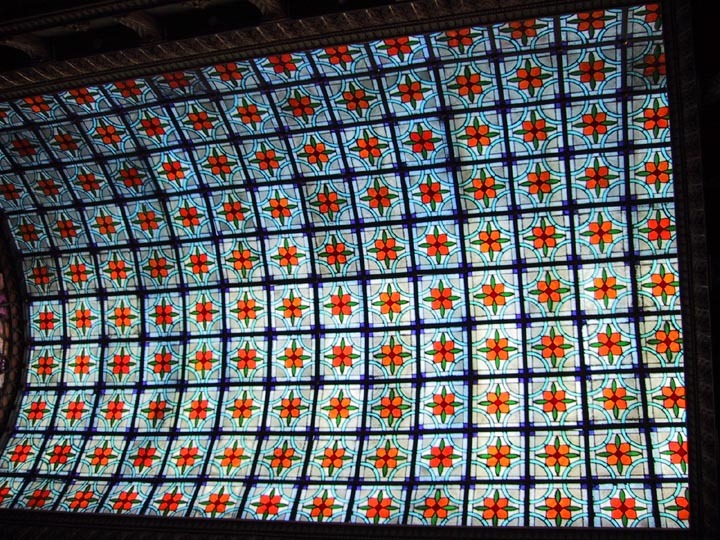 The ceiling of the hotel is made of colored glass tiles that light up beautifully in the bright sun of Turkey. Even though we felt like we were in a different world altogether, it was only mid-afternoon on a perfectly ordinary Thursday in Turkey, too late for lunch, too early for dinner, much less bed. And we didn't want to try and do some serious tourist-ing about late in the day, but getting the lay of the land, so to speak, seemed like a smart idea. So we set out on a trek around the local neighborhood in Sultanahmet. 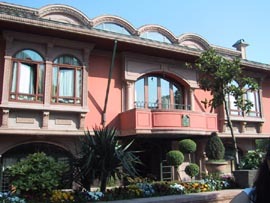 The front of the Sultanahmet Palace hotel from the front terrace. 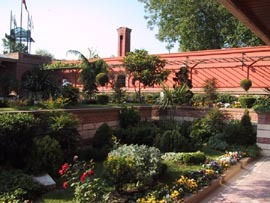 The gardens of the front terrace. More gardens (and some staircase) of the front terrace. 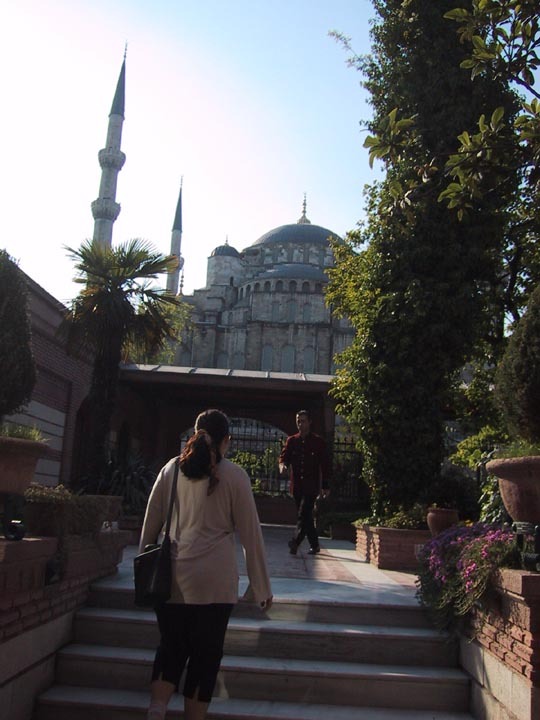 Stacy and the view from the front terrace of the hotel - the Blue Mosque. Just outside the gates of the hotel there was a little travel agent/tour shop. It seemed a smart idea to grab some tour brochures and such, so we went inside. Much to our surprise, the fellow working behind the desk was a Kiwi named Hayden. 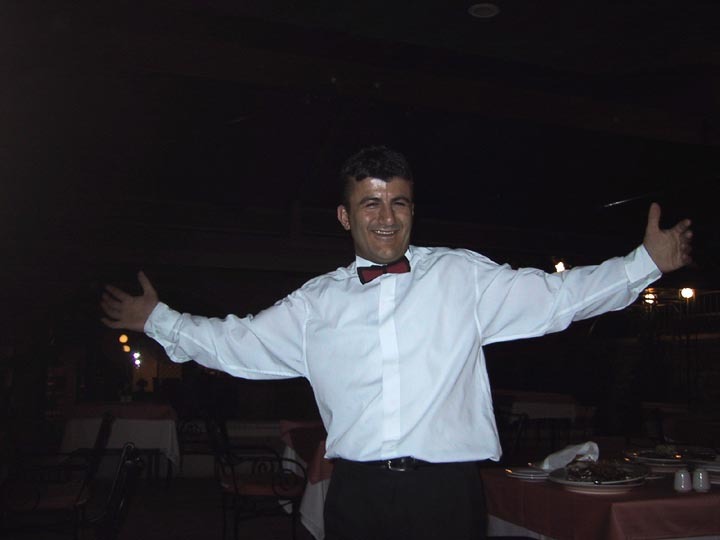 He is a youth hostel type world traveler who on a trip through Europe, arrived in Turkey and decided to adopt it for awhile. 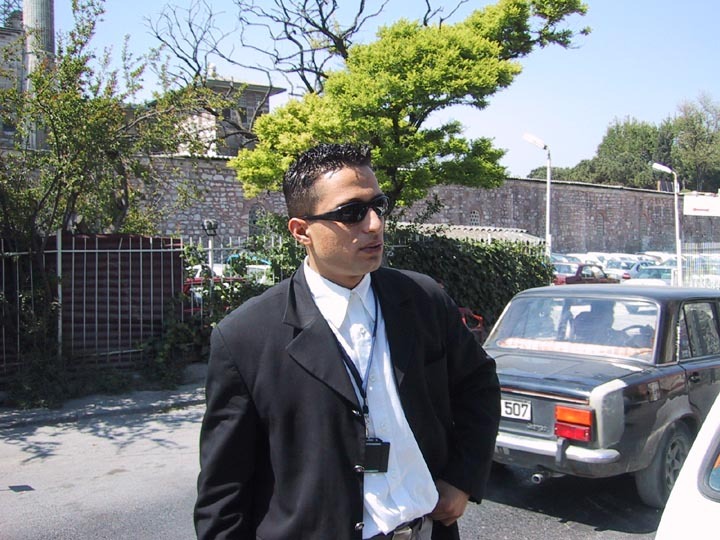 He'd been in the country for over a year, and in demand because he spoke perfect English (like all Kiwis!). So we got some ideas for tours from him, and then continued on our way. 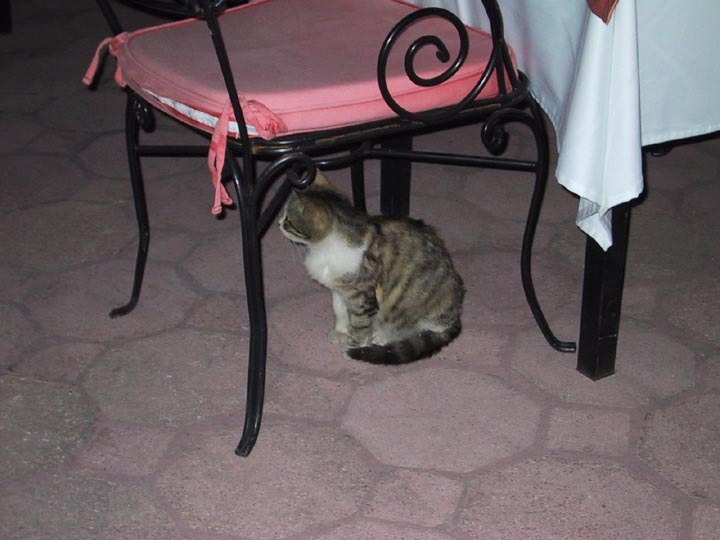 We would end up visiting with Hayden almost every day we were in Turkey. Hayden had warned us that there would be plenty of street sellers inviting us into stores and otherwise acting very sociably to us as we walked - "Just be careful" was his recommendation. 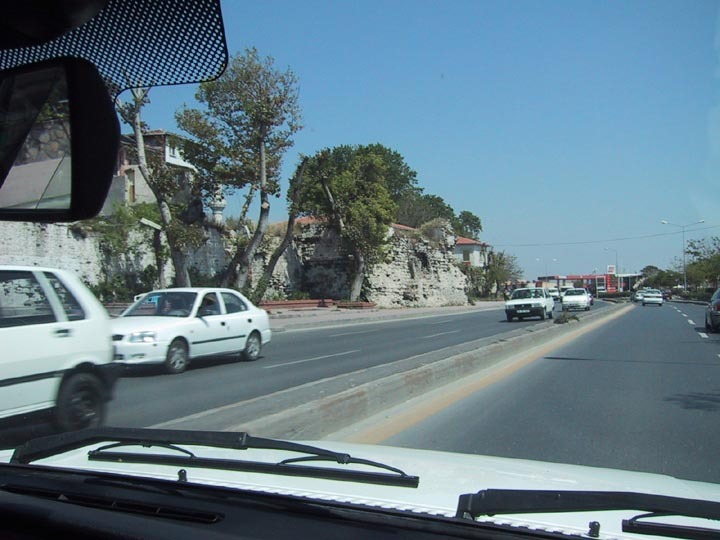 We had been through environments like this before in places like Jamaica, so we weren't too surprised or uncomfortable with the situation of a tourist walking the streets of Istanbul. Every block has a Turkish rug seller - most blocks have more than one, some are filled entirely with rugs. 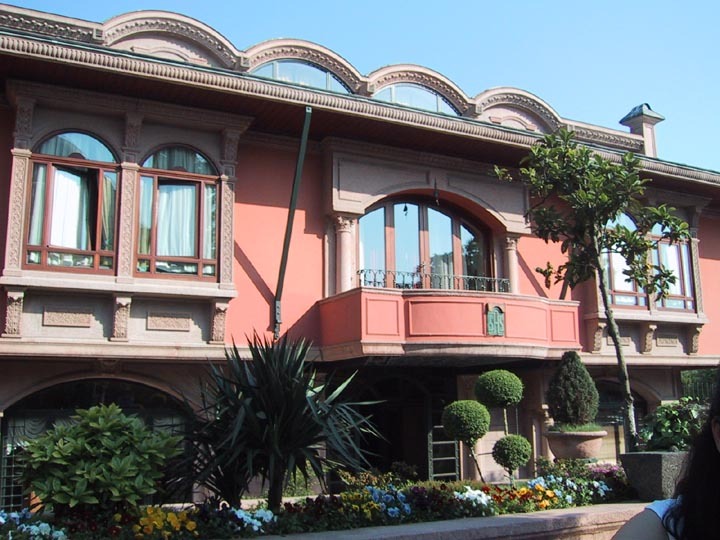 There's also spice shops, restaurants and souvenir shops. In front of every single shop is one or more street sellers. They are very friendly and polite, saying "Excuse me, hello lady, may I talk with you?" or something to that effect. They always ask where you're from, and do their best to mention that they have a friend/aunt/cousin that lives in another place which is hopefully nearby "You are from Vancouver? I have a cousin who lives in Ottawa!" 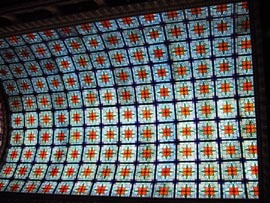 Invariably they invite you into their store to look at their wares. Feeling a little careful, having only been in Turkey for a couple of hours, we declined all invitations and continued our stroll up the street and around the corner. A heck of a street! 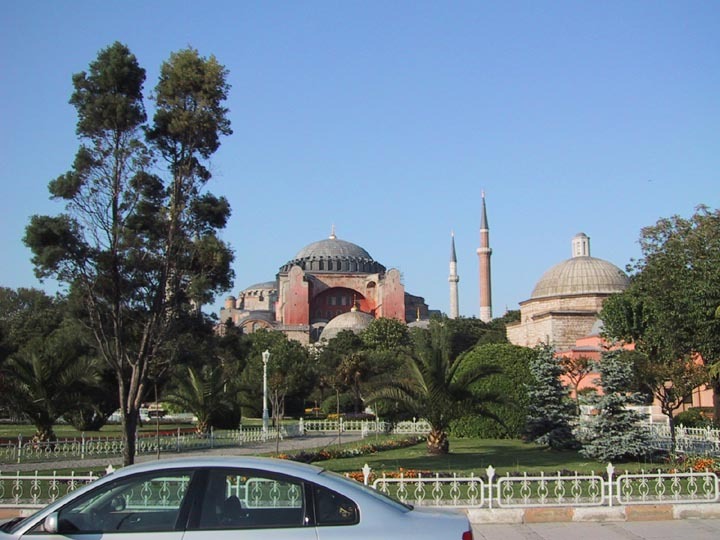 On one side the Haghia Sophia, a massive Christian cathedral built in 537 and converted into a mosque in the 15th century... On the other side of the street, the Blue Mosque, built in 1616 during the reign of the Ottoman empire. 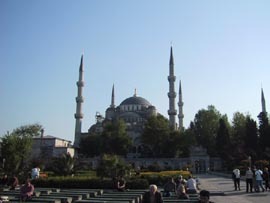 As we passed the Blue Mosque, we encountered a pleasant young fellow who insisted that the Blue Mosque was still open if we wanted to go inside. We weren't ready for interior exploration, but the fellow stuck with us, asking our names, country of origin, etc, etc. His name was Zülküf (pronounced "zoolquoof"), but said "just call me Ali." 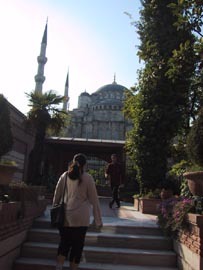 He walked with us for more than a couple of blocks, as we traveled around the Blue Mosque and into an area called the Hippodrome. The Hippodrome was a Byzantine era stadium where all sorts of events were run, including horse racing. The stadium is long gone, the area is now a park. But down the center of the park are a series of monuments that once stood in the stadium, each from a different era of Istanbul. When we reached the end of the Hippodrome park, we sat down on a bench, still chatting with Zülküf. Sitting down apparently frustrated him, he didn't last much longer - eventually he gave us his card and offered to show us his carpets & kilims if we came down to his store. 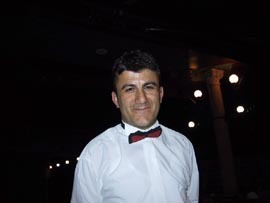 He also said an odd thing we would here a number of times on the streets of Turkey... "You look like carpet buyers." Carpet buying is serious business in Istanbul, and no carpet merchant can imagine that you would come to Istanbul for any reason other than to buy a carpet. Apparently, saying "But I don't want to buy a carpet" in English translates to "I don't truly understand the wonders of carpets and carpet buying in Istanbul, please expound most enthusiastically on these amazing and awesome products you charming young man" in Turkish. 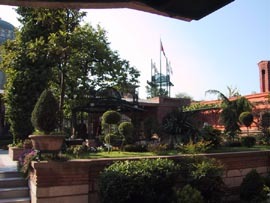 Walking back from the Hippodrome, we discovered an ATM machine and withdrew 100,000,000 (yes, one hundred million) lira. Later we would find out that this translates into about $140 Canadian, or $90 US. 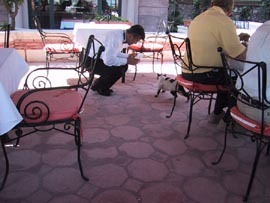 We returned to the hotel with a minimum of fuss (meaning we dodged a lot of carpet sellers) to clean up for dinner. 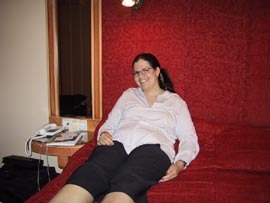 Stacy resting up for dinner, notice the cool European-style pants! Another stray cat under the table, plotting the theft of a roll. This is Arnot, our very silly waiter. The table next to us decided he looked like Bruce Willis and had been calling him "Bruce" all night. How do we know that Arnot is silly? "Hey Arnot, how big is the creme brulee?" 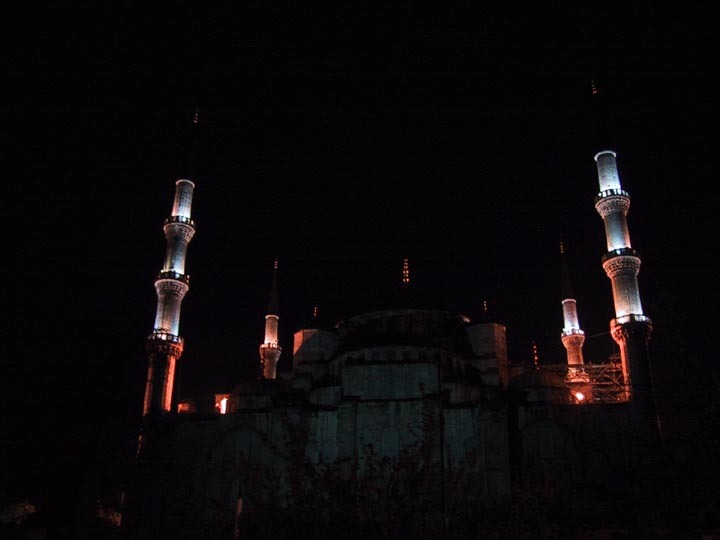 That was the end of our first day in Turkey. We went back to the room - I made a few attempts to get online but was unsuccessful. We did take some time out to call Caitlin on her birthday - Happy Birthday Caitlin! 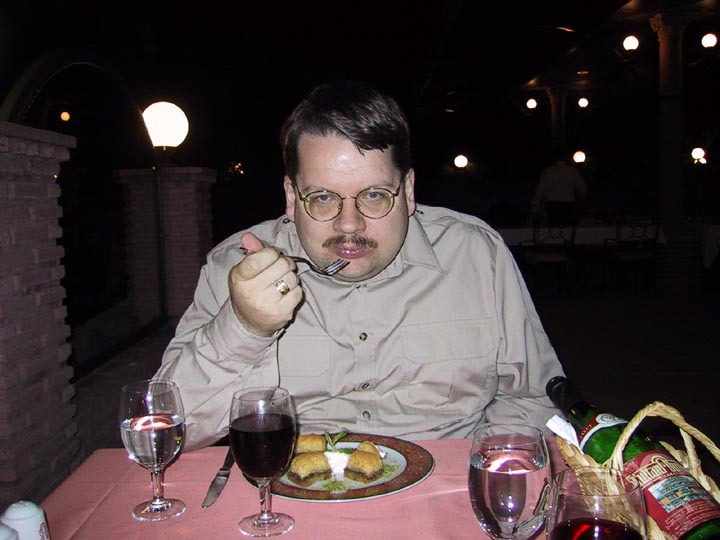 The Compuserve service in Turkey is different from the rest of the world for some reason and we were too tired to argue about it - uploading was something to worry about tomorrow.